Switch Poker certainly lives up to its name with its unique features and being one of the few online poker rooms that accepts Bitcoin alongside other more popular deposit options. Switch Poker is a site that caters to mobile and tablet devices and have their poker software optimized to give mobile poker nuts the best possible gaming experience. Anyone who owns an Apple or Android device can play at Switch Poker. Please note that US players are not allowed to play at Switch Poker, even if they deposit using Bitcoins. Rake at Switch Poker is much higher than SealsWithClubs and Betcoin Poker. For stakes of 25NL and lower the rake is capped at €2, games between 50NL/100NL at €2.50, 200NL-1kNL at €3, and anything over 2kNL at €4. 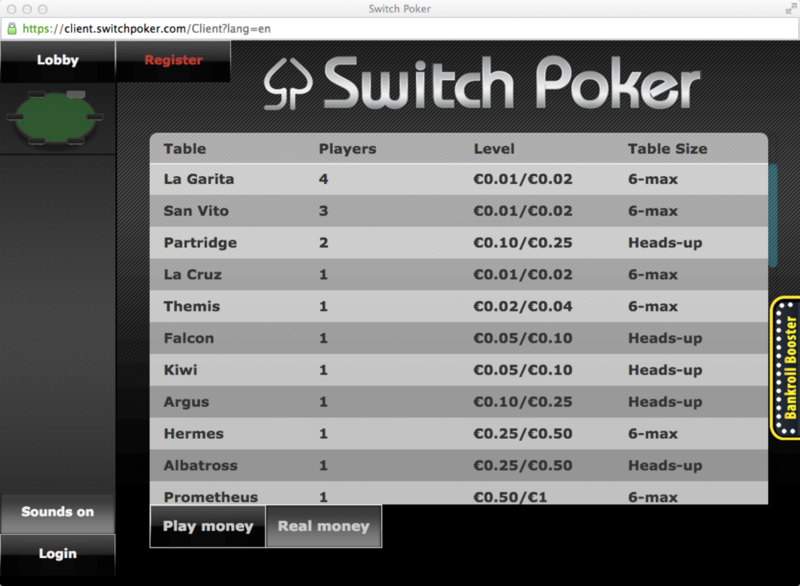 Switch Poker only offers the NLHE format but has HU, 6-max and full-ring tables. The average player pool ranges from 60-200 depending on the time of day. Unlike any other mobile poker room, Switch Poker lets you play up to four different tables at once on your mobile or tablet device. Switch Poker focuses only on NLHE cash games. They do not run MTTs or SNGs as of yet, but we expect this to change in the near future. Because it’s a mobile-based platform, there isn’t much of an in-room support option, but response time is quick for email. Customer service channels offered by Switch Poker were below our expectation. Their support staff did reply to our emails in a timely manner but they offer no live-chat nor do they have an active Twitter account. As our website gives away, we focus on Bitcoin related poker rooms, Switch Poker is one of the few online poker rooms that accepts Bitcoin with other payment methods. As with every poker room we have tested thus far, deposits were made instantly and we received our withdrawal within 15 minutes using Bitcoin. You can also deposit on Switch Poker using Visa, Skrill, Moneta, Ukash, Neteller and MasterCard. Switch Poker is currently the only online Poker room that allows players to multi-table on mobile devices and use several payment methods to deposit that include Bitcoin. 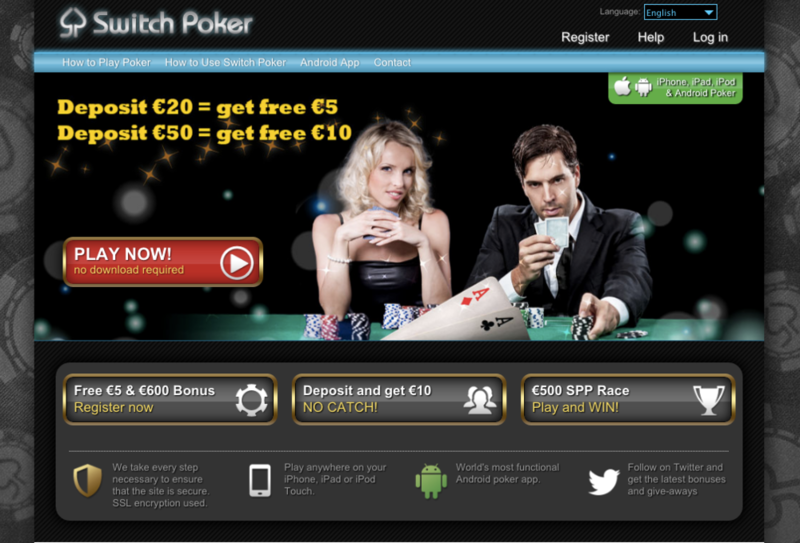 They offer a first time signup bonus of Switch Poker €600 with a 6 month time limit to clear. If you are looking to play poker on the go, during your lunch break, the commute to work or even in your bed, you needn’t look further than Switch Poker. Hardly any regular poker players use this site as it’s mobile based resulting in the player pool being packed with fish and recreational players. If you are looking for a Bitcoin friendly poker room with plenty of targets, you have found it.